After the release of the magnum opus flick Baahubali. The Tollywood Ace director S.S. Rajamouli’s name is circulated in national news channels and in social media in any some manner. Now he turned to be a teacher at IIT Madras in the Student Activity Center (SAC) auditorium in Chennai. Rajamouli has been invited for giving a special speech in seminar. He interact with the students and teach them a bit of filmmaking. At the time of delivering a special speech he opened up his his dream project ‘Mahabharata’ and in the session of Question & Answers with students he tells about his copied scenes from Hollywood movies. 21 Tollywood Heroes in One Scene ? Bruce Lee Movie First Day Collections Worldwide, India, AP. Director S.S. Rajamouli confess that he Copies From Hollywood Movies. At the participate in Q & A sessions with students he said that “Yes, I copy from Hollywood movies. It’s obvious and most of you know that“ for the question asked by a student. “When I was an assistant director most of my fellow assistants weren’t good enough in English and they didn’t watch English movies. During the story sitting, if I narrate a scene from Hollywood movies, the others will believe and say, ‘Hey, this guy has a lot of creativity‘”. After the completion of the session by S.S. Rajamouli the auditorium resound with the claps of the students and guests for his brave confession. 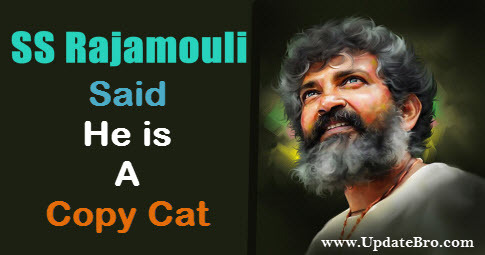 Here is the exclusive video of SS Rajamouli speech at IIT Madras. Here is the video about Rajamouli’s Copied Scenes from Hollywood. If you like this Rajamouli Says he is a Copycat article. Please share it to your friends and let them to know Rajamouli’s Copied Scenes in movies. AP Capital Amaravathi Foundation Ceremony Invitation Card. The Great Khali’s Ambuja Cement Ad 2015 – Makes You Laugh.